First snow came down – white beautiful snowflakes were snowing, covering the earth with white. First I literally couldn’t believe my eyes. 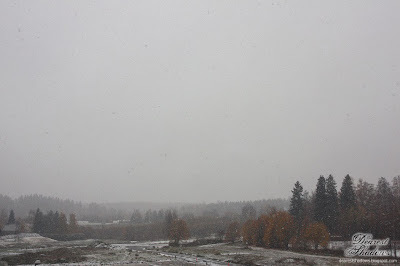 I thought was I seeing my own things or saw a dream but it was actually snowing! Cats wanted to go outside, although I was skeptical how long they could bare being in the balcony. 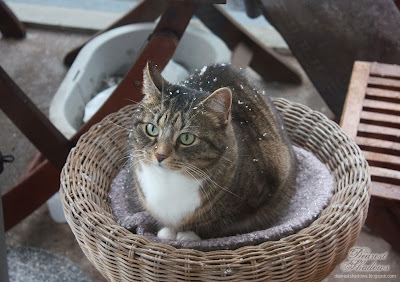 Soon Pikkunen was scratching the door and when I went to open the door, I saw Lara and her fur was full of snowflakes. Cute. 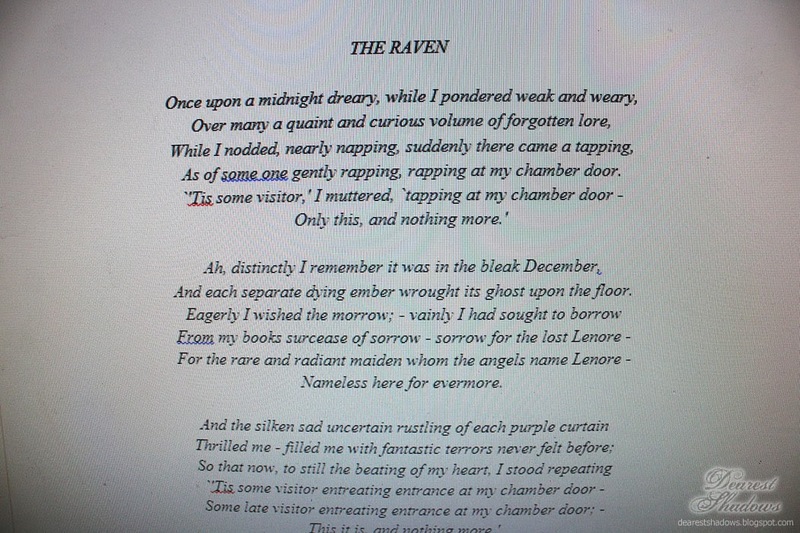 Edgar Allan Poe’s poem “The Raven” plays quite a big part of my second project and tells you a little bit about the subject. 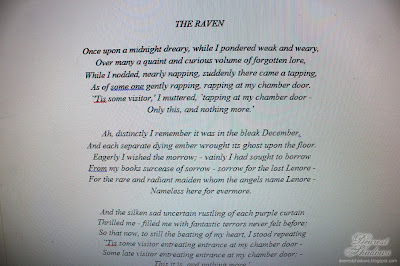 I can’t yet tell the exact idea or plot but it does include ravens and raven-like things. I don’t like to call my writing projects books for they aren’t there yet. Only when I have finally finished one of them and taken it to the publishing agencies, then I can call it a book. The word “book” makes it sound so grandiose and ready and perfect, which none of my projects are not yet. Or maybe my oldest project is closest of being a book, but it still needs a lot of work and re-reading. I was talking with one of my friends on the other day and I started to talk about my writings and she told me she would like to read them some day – that’s good, for I need some readers to read what I have written and tell what they think about the text and all... I have translated the first part (there are many, many parts) of my first writing project, for I had started to write it in English at first. My friend said it doesn’t matter whether it’s in English or Finnish but I like it to be Finnish. So now I need to re-read the first part and polish it a bit if needed and then I can let people close to me read it, even it’s a hard subject. I’m so excited on what they are going to be thinking about it for I don’t consider myself as a writer. But is it that if I don’t see myself as a writer yet, can I ever be one? I think that when my first actual book has come out then I can call myself a writer. I want to be a writer. Now I can call my writing a hobby but I would like to call it a job one day.